The Elite Quarters is a room in the Phazon Mines. It connects the Elite Quarters Access to the Processing Center Access by Red Doors. The room is extremely open, with an upper walkway. The lower floor has three areas of Phazon scattered around. 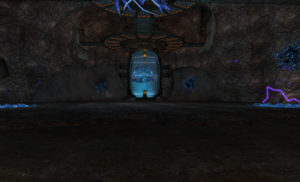 A large stasis tank is in the center of the room containing the Omega Pirate. It will break free when Samus approaches and the doors will lock. During the Omega Pirate battle, it will summon random a variety of Trooper Pirates. Once the Omega Pirate has been defeated, Samus will obtain the Phazon Suit and the Phazon Beam, and a nearby elevator will activate leading to the upper walkway. If Samus returns later in the PAL and Trilogy versions, three Fission Metroids will appear, one above each pool of Phazon.